Utopiaansch weekblad nos. 3-9 & 11-13. Amsterdam, H. Moolenijzer, "Dageraad, den 44 Stoeborn A[nn]o. 5569" [= 1819]. 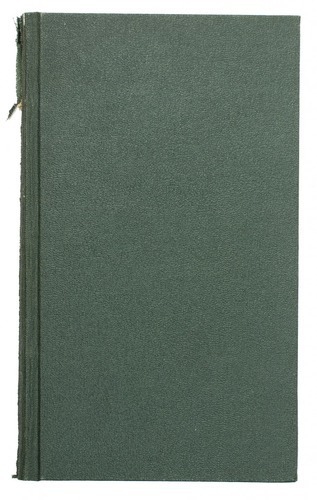 Folio broadsheet (44 x 26.5 cm). With a woodcut illustration as headpiece. Folded and unbound. 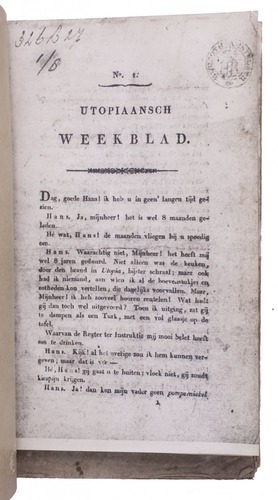 10 instalments of the very rare Dutch satirical periodical Utopiaansch weekblad, written anonymously by Wibmer in the form of dialogues between the author and the Utopia-born servant Hans, who informs him of the latest gossip. 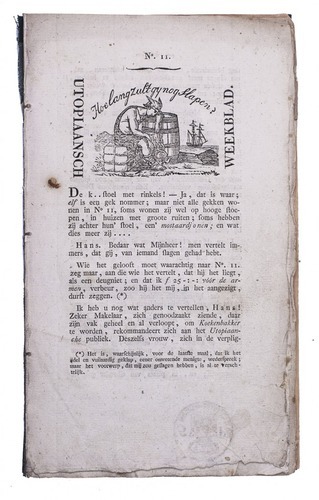 Added is instalment 6 of Wibmer’s similarly absurdist Utopiaansche courant, a periodical that preceded the Weekblad and satirized King Willem I, who had ruled the Low Countries since Napoleon’s defeat in 1815. Both periodicals contain severe but cleverly hidden criticism of Dutch politics, society and circumstances of the day. Wibmer (1792-1836), trained as a minister of the Walloon Church, acknowledged his authorship, leading the church to relieve him of his post. 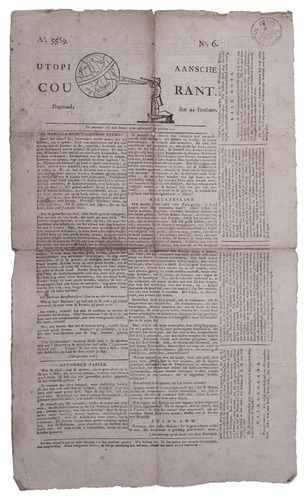 On 8 September 1819, soon after publication of the present instalment 6 of the Courant, Wibmer was arrested along with the publisher and printer (Molenijzer and Brouwer) on various charges, including sedition. 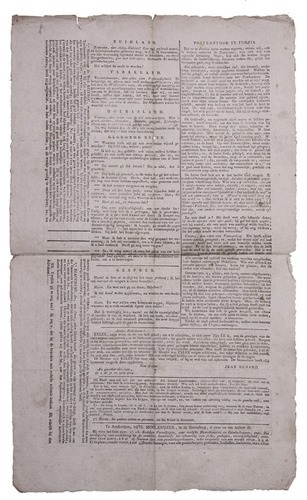 He successfully argued that his text had no comprehensible meaning and was acquitted, publishing his witty defence as Pleitrede (1819), as well as a 7th number of the Courant and then the present Weekblad. 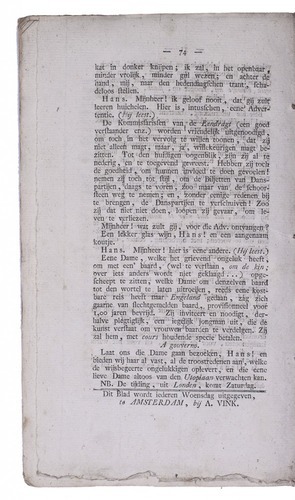 On 6 April 1820, soon after publication of the present Weekblad 12, he was arrested again. This time he was convicted on some counts and sentenced to six years’ imprisonment. Perhaps he had already written nos. 13 and 14, published after his arrest. Released a year early, in 1825, he publish an account of his second arrest, trial and incarceration, and continued his satirical writing. Each instalment with a tax stamp. Spine split, leaving the back board and a few instalments detached. Some occasional foxing, but most of the instalments otherwise in good condition. Ad 1: Laurens Ham, Door Prometheus geboeid (2015), pp. 47-83; NCC (3 copies); WorldCat (3 additional copies, incl. 1 incomplete); cf. W.P. Sautijn Kluit, "De narrensteinsche, utopiaansche en liliputsche couranten" in: De Nederlandsche spectator (1872); ad 2: Ham, idem.